About — Self Care is a thing. Joey Bothwell started her love affair with the body, training as a classical dancer for almost two decades. The celebration of the body then lead her to various different studies including The Middendorf breath technique, psychology, neuroscience, yoga, meditation , quantum healing and self regulation therapy. This study became more intense after a traumatic, life altering bicycle accident in 2012, in which she was confronted with a choice to depend on heavy pharmaceuticals or invest in the curiosity she already had to heal herself from the inside out. 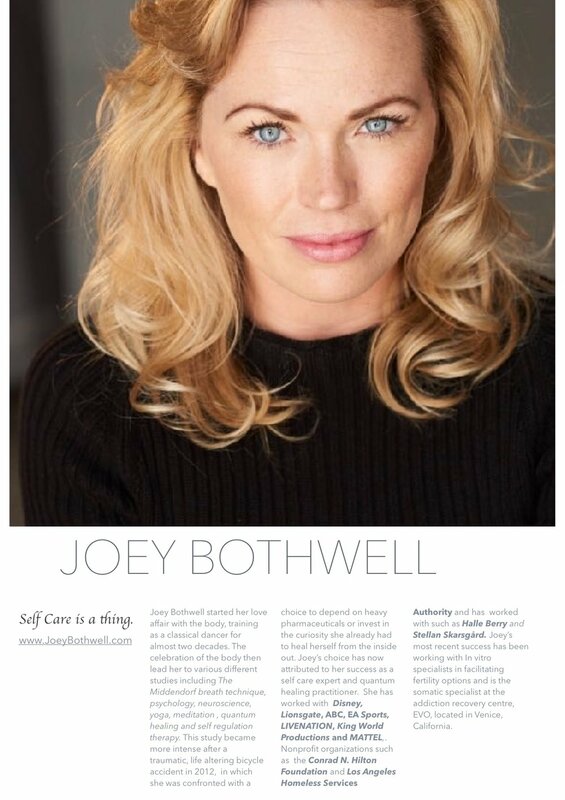 Joey’s choice has now attributed to her success as a self care expert and quantum healing practitioner. She has worked with Disney, Lionsgate, ABC, EA Sports, LIVENATION, King World Productions and MATTEL,. Nonprofit organizations such as the Conrad N. Hilton Foundation and Los Angeles Homeless Services Authority and has worked with such as Halle Berry and Stellan Skarsgård. Joey’s most recent success has been working with In vitro specialists in facilitating fertility options and is the somatic specialist at the addiction recovery centre, EVO, located in Venice, California.